Gold seals for being Bilingual? Who knew one could earn gold seals, recognition, college credit and save thousands of dollars for being bilingual? Up until a few weeks ago, I sure didn’t – and neither do many students. Here are some answers, to the who’s what’s, where’s why’s, and how’s about the Seal of Biliteracy test. 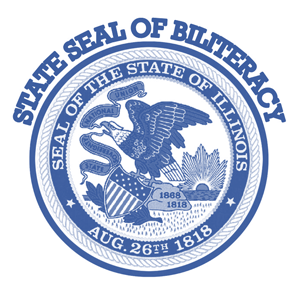 What is the Illinois Seal of Biliteracy? According to the Illinois State Board of Education, “The Seal of Biliteracy is an award given by a school, school district or county office of education in recognition of students who have studied and attained proficiency in two or more languages by high school graduation.” The seal is quite literally gold and when awarded, it appears on your high school diploma as well as school transcripts for colleges and future employers to see. To qualify for this seal, it is crucial to be proficient in two or more languages to be considered bilingual. The majority of students in J. Sterling Morton High School District 201 are of Hispanic or Latino backgrounds which means many of the students opt to take the test in Spanish but that does not mean the test cannot be taken in different languages. According to the Seal of Biliteracy the test is for “all students who master standard academic English and any other language including American Sign Language.” This also means that scoring high on a foreign language AP test could mean one is an excellent candidate for the seal. As a test taker myself I completely agree with Ms. Garcia. Being raised in a Spanish speaking household I taught myself how to read,write, and speak Spanish which is a common cultural situation. Until I personally took the test, I never realized how many writing mistakes I was making until I was writing extensive writing responses which included accents, correct, punctuation, and grammar. Had I practiced or gone to a biliteracy preparation class, I would have made significantly less mistakes. How long is the biliteracy test? The entire biliteracy test is lengthy and takes around 3 hours (give or take) to complete. There are four sections to the test. Listening Comprehension, Reading, Writing & Speaking. Personally, I did not find Listening or Reading difficult but that may not be the case for all. The most difficult portions for me were writing and speaking. They were difficult in my opinion because, I have never learned where to place accents or grammatical punctuation. To complete the speaking portion you must speak into your headset after being asked questions by the computer simulation. This part was fairly awkward because one had no time to fumble with answers as the questions flow in the order of a natural conversation with another foreign language speaker and the length of the answer is being recorded for up to one minute and forty-five seconds. Also, the recording cannot be stopped or redone. Recordings are final which makes this section a little nerve-wracking. All-in-all I would have done much better with even the slightest preparation. What are the benefits of the Seal of Biliteracy Test? As previously stated, one of the many benefits of the bliteracy test includes a gold seal which appears on ones high school diploma and school transcripts which can increase college admissions chances and later used on applications for employment. Not to mention, getting the seal can earn you up to 12 college credit hours depending on your overall score, which can save hundreds of dollars in college classes. The Seal of Biliteracy test will help students improve more in grammar & speaking. The test will show students the mistakes that they have been making while speaking different languages. Like the writer, I as well have difficulty with accents and punctuation. While accents and punctuation are important, the test evaluators are more interested in seeing evidence of students being able to express complex ideas in academic language. The content of your ideas are more important than accent marks, so don’t let that keep you from trying! Its great that The Sterling is advocating for Biliteracy. Many are not aware or do not believe preparation is necessary. Lots of time, effort and money can be saved if the biliteracy test is taken seriously. If one is apart to the Biliteracy program they will receive awards at the end of the year for their accomplishments. I thought this article was very interesting and well-throughout. The layout and structure of the article reminds me of an article in the New York Times. I enjoyed the topic of the article and thought it was a great read. It is great to know that this is available to all students not just Hispanic ones, but also that it is being advertised on such a broad and expansive website so all the students attending Morton could know and have to opportunity to take the test, that could help improve their future life. Thank you for spreading the word in such an eloquent and informed manner! We adults will continue to promote it the best we can, but your perspective as a student who has actually taken the test is invaluable. This is an exciting moment- you are all finally getting credit for the extra knowledge you’ve been accruing over the years! By the way, we already have MORE seniors who have earned the Seal of Biliteracy this year than last year, and we’re only in November! We hope more students will follow Giselle’s example, prepare and step up to take the test and earn the Seal. Come see us in Ms. Garcia’s room (D225) Thursdays after school for help. We’re going to be sharing some test prep materials in upcoming meetings.